ANGE Postecoglou had already made the gut-wrenching decision to quit his Socceroos project on the eve of the 2018 World Cup - but the realisation only kicked in this morning when making his announcement. He is fully aware of what he is giving up - the chance to lead his nation to a second straight FIFA World Cup - hence the decision wasn't made lightly. That was evidenced at this morning's press conference when he was choking back tears. Postecoglou is known for his ice-cool, almost cold exterior as a coach. Today was his most emotional public showing in his 21-year coaching career. Postecoglou contemplated a change of heart in recent days, tempted by the lure of leading this improving group that has his fingerprints all over it to Russia 2018. But Postecoglou is stubborn - just ask his closest mates - and when he makes his mind up on something he seldom buckles. His decision to walk was made months ago, and it was going to take something compelling from FFA chiefs Steven Lowy and David Gallop to keep him here. 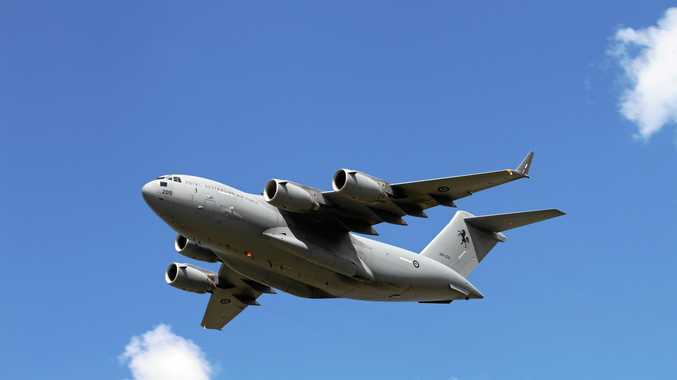 But with a dark political cloud hanging over FFA, with FIFA about to step in, their hands were tied. It wasn't about money, but the state of the game. This is where the unrest appears to stem from. Postecoglou conceded he was probably too emotionally invested in the Australian game. "It's been the toughest decision, it's not the ending I envisaged,'' Postecoglou said. "There wasn't really a tipping point. It's something I've mulled over for a while, I guess it's just the nature of me as a person. 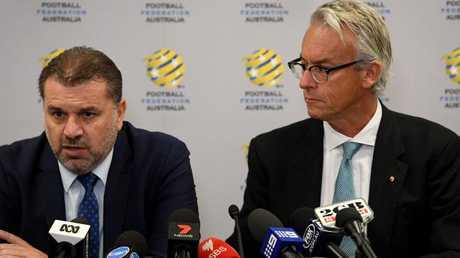 David Gallop (right) says he was puzzled by the decision made by Ange Postecoglou. "I really tried to coach for the moment, knowing there's the possibility it could end any time. I'll always have a sense of unfinished business, I think that would have happened whenever I left. "I'm just so invested in football in this country, whatever role I've had in or out of the game, football will always be dear to me and my major driver. I'll always think I could do something more. "Overall, sometimes it's just an instinct that I just think it's the right time for me and (FFA). "It's been all encompassing. It hasn't just been coaching the national team - the bit I dearly love is the coaching." Postecoglou was set to quit in the days after the Thailand World Cup qualifier in Melbourne in September had the Socceroos advanced from their group automatically. He felt compelled to finish off the job in the World Cup playoffs against Syria and Honduras. Today's announcement was mere confirmation of his intentions. An emotional Ange Postecoglou wipes away tears at the media conference on Tuesday morning. 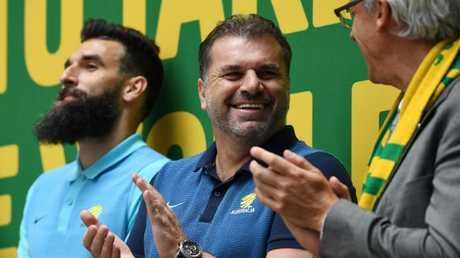 Postecoglou will now turn his attentions to landing a job overseas, and he will throw himself at that with the same fervour that's underlined his Socceroos tenure over the last four years. It leaves the Socceroos post vacant just over six months out from the World Cup and a week out from the draw for the 32-team tournament in Moscow. FFA chief executive David Gallop appointed Postecoglou and admitted he was disappointed. "I'm disappointed and still a bit puzzled,'' Gallop said. "(Postecoglou) gave our fans a sense of optimism. Whatever you do I know you'll be successful. Ange Postecoglou (middle) with Mile Jedinak and David Gallop in Martin Place after the team qualified for the 2018 World Cup. "The process going forward, we won't be rushed, the Socceroos have a big gap in the calendar now and its important we do get the right person to fill the big shoes." A Russia 2018 spot with a youthful, improving Socceroos side is a tantalising prospect for overseas coaches, let alone locals. 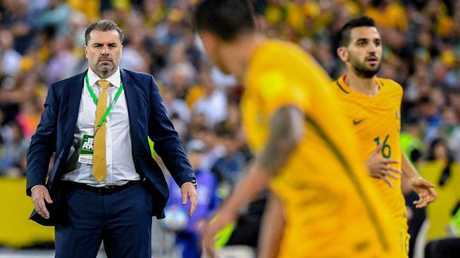 Since the Herald Sun revealed last month that Postecoglou would quit in November even if the Socceroos beat Honduras to qualify, debate has raged about his reasons, coaching style and demeanour. Ange Postecoglou’s final match in charge was the clash against Honduras which clinched Australia’s World Cup spot. But Postecoglou was intent on doing it his way as he always has done and he was hellbent on leaving the Socceroos post on his terms. He made that promise to his wife and that was the moment he became most emotional in the press conference. "To my three boys - you make me smile every day. And to my beautiful wife - I'll never be able to repay the sacrifices she's made for me to follow my dream over the last four years,'' he said.